In 2012, Anthony Skuse directed pantsguys Productions’ award-winning indie production of Punk Rock, written in 2009 by UK playwright Simon Stephens. Now, Skuse directs Stephens’ 2005 play On the Shore of the Wide World for pantsguys and Griffin Independent – and it’s another memorable production. Set in Stephens’ native Stockport, a town in Greater Manchester, the play tells the story of three generations of the suffering Holmes family over the course of nine months. Peter (Huw Higginson) and Alice (Amanda Stephens-Lee) are muddling along OK but are hurt and upset when their teenage son Alex (Graeme McRae) and his new girlfriend, the spunky Sarah (Lily Newbury-Freeman), want to escape to London. Meanwhile, their sweet but odd younger son Christopher (Alex Beauman) is instantly smitten with Sarah. Living nearby are Peter’s alcoholic father Charlie (Paul Bertram), who has a close relationship with his grandsons, Christopher in particular, and Charlie’s nervous wife Ellen (Kate Fitzpatrick). Christopher catches his grandparents unawares one day and is rocked. Then a sudden tragedy forces buried emotions, shame, secrets and regrets to the fore and the family find themselves confronting and opening up to each other as they struggle to find a way to move forward together. Running three hours including interval, the first act is a slow burn but the second act flies as the emotion builds. 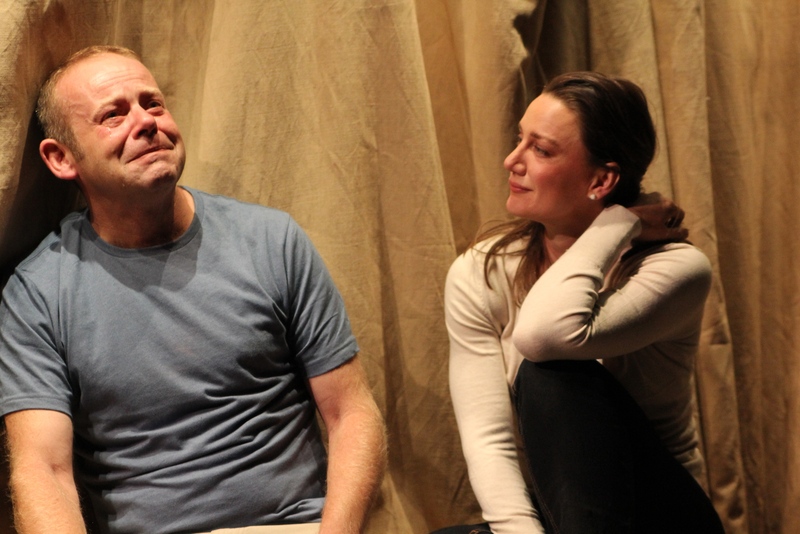 Skuse directs a quiet, beautifully measured, subtle production, in which the actors often stay on stage to watch scenes they aren’t in, the compassion in their eyes intensifying the emotion. There are excellent performances all round from a cast that also includes Jacob Warner as Alex’s drug-dealing friend Paul, Emma Palmer as a comparatively posh, pregnant publisher who employs Peter to renovate her home and develops quite a bond with him, and Alistair Wallace as John who meets Alice as a result of the tragedy. Higginson (well-known from ten years playing PC George Garfield in The Bill) is a stand-out though with a heartbreakingly portrayal of the loving but emotionally inarticulate Peter. An engrossing, moving drama. This entry was posted in Theatre and tagged Alex Beauman, Alistair Wallace, Amanda Stephens-Lee, Anthony Skuse, Emma Palmer, Graeme McRae, Griffin Independent, Huw Higginson, Jacob Warner, Kate Fitzpatrick, Lily Newbury-Freeman, pantsguys Productions, Paul Bertram, Simon Stephens by jolitson. Bookmark the permalink.